The film documenting 2018’s NY-LON Exchange Programme film has now been released. 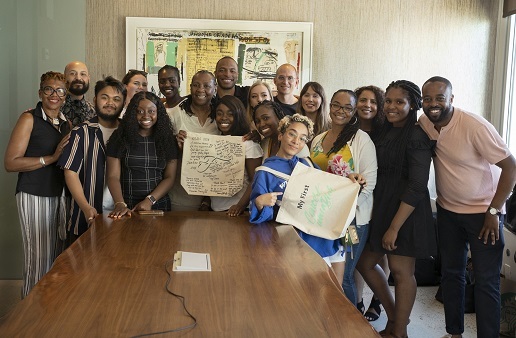 Now in its fifth year, the NY-LON Exchange Programme, is a trans-Atlantic collaboration between UAL, music icon Jay Z’s Shawn Carter Foundation and Brand Design Agency Vault49. The NY-LON Exchange Program gives students from low income backgrounds studying in London and New York who are the first in their families to attend university an opportunity to work together on collaborative projects and broaden their creative networks. 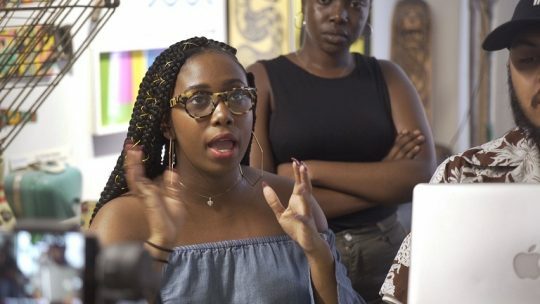 Conceived by UAL’s Widening Participation and Progression leader, Lawrence Lartey – the programme started as a pilot project, supported by Jay Z’s Shawn Carter Foundation, and New York brand design agency Vault49 – founded by former London College of Communication alumni John Glasgow and Jonathan Kenyon. This year’s exchange brought together nine students, who were given a creative brief to work on over several months, culminating in a week collaborating face-to-face in London and another week in New York. 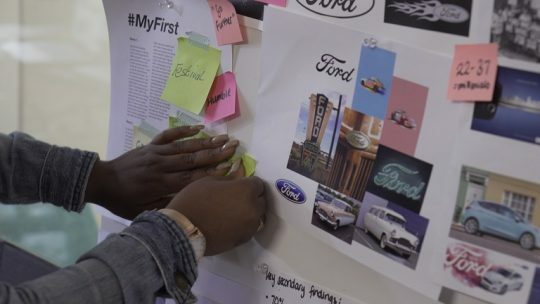 This year’s challenge was to come up with a creative campaign to connect Ford Motor Company with millennials. Vault49 agency founders, John Glasgow and Jonathan Kenyon, host the students at their New York studio during the US half of the program. They also provide financial support and design expertise to the project. “Without UAL, Jonathan and I would never have met and there might have been no Vault49. Getting involved with the NY-LON program seemed like a fantastic way to show our gratitude and give something back to the college – and to offer creative students from backgrounds just like ours a chance to gain experience, to travel and to build contacts and collaborate. “It’s been a fantastic year for the NY-LON program – the best yet I think. The students had much longer to work on the brief before the exchange weeks, so they were ready to hit the ground running in London and New York. “They spent a week in London researching their topic, studying the market, looking at audiences and so on. Then they travelled to New York, where they spent a week in the Vault49 studios, using the brilliant design and production facilities there to work on their ideas and turn them into something real. The group gelled quickly and worked very well together – it was great to see. 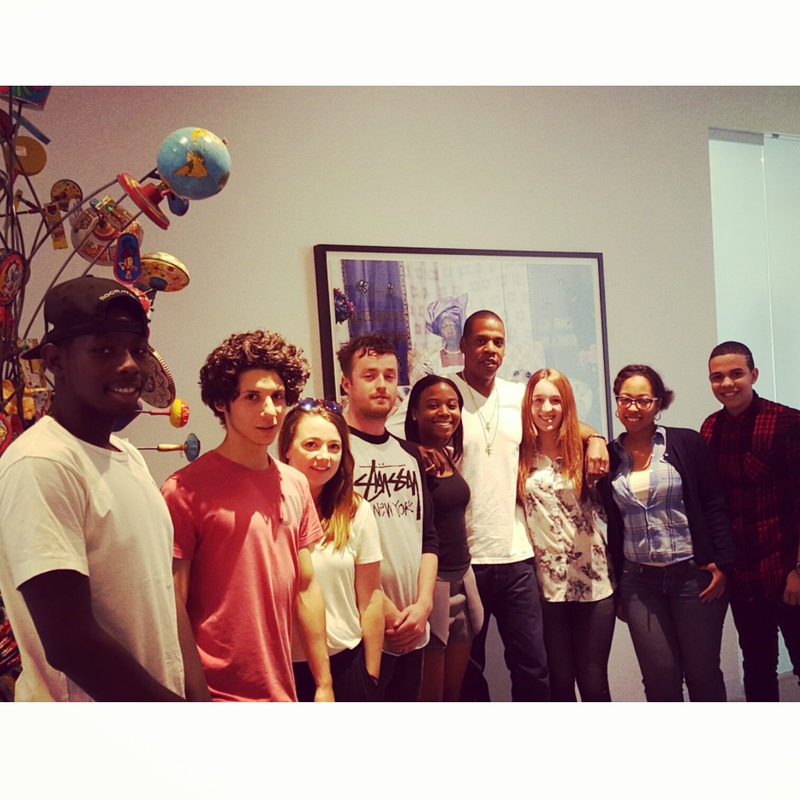 The NY-LON program came about from a conversation in 2013 between UAL’s Widening Participation and Progression leader, Lawrence Lartey and music icon Jay Z about how UAL could collaborate with Jay Z’s Shawn Carter Foundation to give students a chance to travel the world and have new cultural experiences. The Foundation was set up in 2003 by Jay Z and his mother, Gloria Carter, who is its President and plays an active role in the NY-LON program.